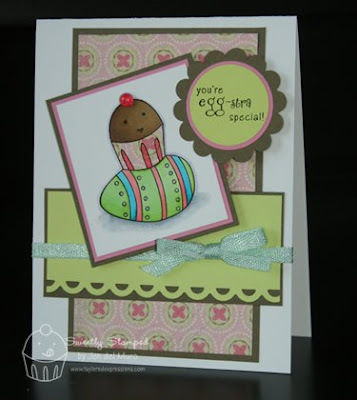 Stamp a Sweet Impression: You're Egg-stra Special! I know that there are lots of people out there like me...not that much into all the techniques that are available to us stampers. I'm not saying that I don't like the way they look, but the process is what I don't enjoy. I stick to the basics and try not to make *too* much of a mess while creating...is that possible?!? Paper piecing is one of my favorite techniques and is so fun to do with all of the Stamp A Sweet Impression cupcake stamps. I like "dressing" them to match the rest of my card. This card uses stamps from the new set, Sweet Spring. 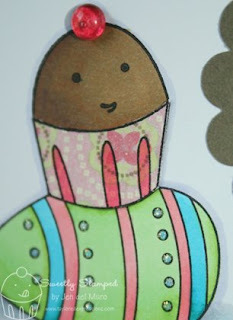 As you can see from this close up, I "dressed" the cupcake in the same designer paper (from the new Key Ingredients Kit) as the large background panel. To give it a little more depth, I colored in the indentations with pink Copic marker. I'm not a "technique girl" either, Jen, but you're right, paper piecing is FUN! LOVE your card!! Ahhhh so sweet Jen! Love the glitz and the piercing...ever so sweet.